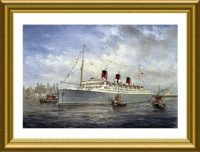 The great white liners of Canadian Pacific were so much a part of the spectacular Liverpool maritime pageant, with their every arrival and departure greeted with, bands, boat trains and hundreds of spectators. 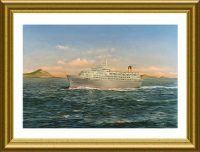 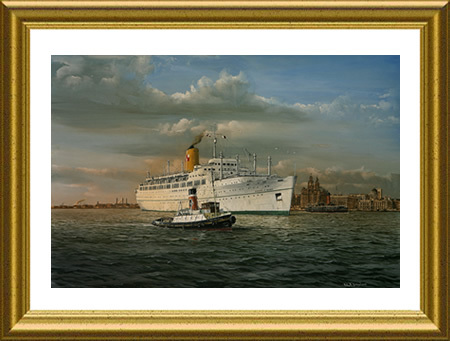 It’s such a shame that your can no-longer stand on the Liverpool shore and see such sights, but this wonderful painting by Robert of the Empress of Britain arriving, really is quite special and brings back so many special memories of that Golden Age of Ocean Travel. 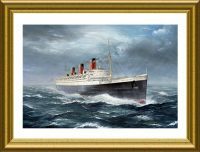 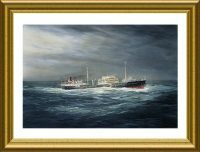 The size of this painting, framed in antique guilt is 32″ X 27″ inches and is featured on the front of Episode 26 in the Great Liners series, “The Great Port of Liverpool (Part 1)“.